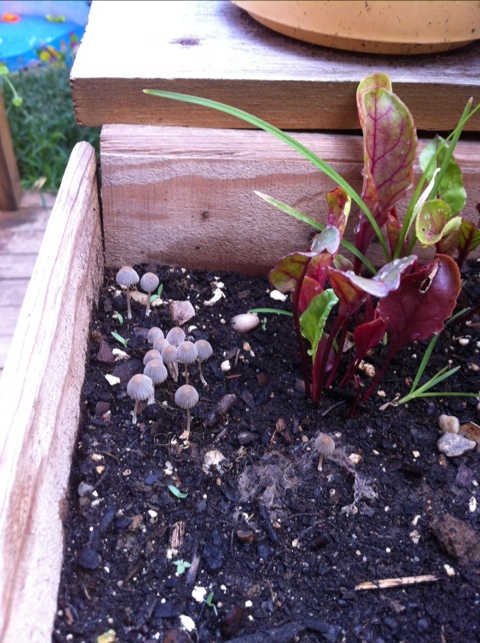 These little buggers appeared next to some beets I have growing in a wooden box. Note the leaves of grass growing right next to/within the beet leaves. Like I said, unless they pose a take-over threat, I generally leave them alone. These guys were growing so close to the beets that pulling them out risked damaging the beets themselves. Voila! Weed problem solved! I have very similar ‘shrooms that come and go in my banana plant pots. It seems some time in the sun and they shrivel turning to dust if you touch them. The bananas stay almost exclusively indoors with an occasional short stay outside if it’s not too windy or sunny. The cool, moist, somewhat dark environment is to the mushrooms liking. Mine keep growing back, so I guess they leave their spores behind when they crumble. Somewhere I heard that mushrooms, even poisonous ones are ok if they decompose into the soil.